Every industry offers pinnacles. Entertainers aspire to Oscars and Grammys, doctors and diplomats to Nobels, and chefs to Michelin stars. Great Lakes Culinary Institute graduate Leslie Farrer has barely begun her career and has already helped collect one of those coveted stars. The Traverse City native, 27, is a pastry sous chef at Trump Hotel in Chicago. One of its restaurants, Sixteen, just earned its second Michelin star. 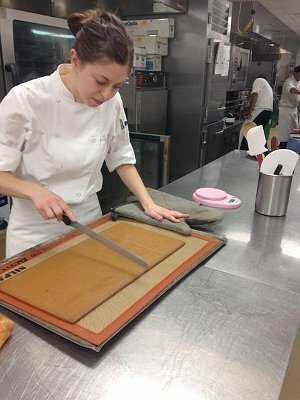 Farrer discovered her interest in pastry while working at a restaurant as a student at Traverse City West High School, and toured Chicago’s renown French Pastry School. But she didn’t want to move at age 18. Enter the Great Lakes Culinary Institute. She found the culinary curriculum, from knife skills to purchasing to menu planning, second to none. She also took her first pastry classes with Skarupinski, who remembers her as an excellent student. In contrast to savory cooking, pastry is technical. “Pastry attracts more people who are good at math. Our recipes are very specific, they have to be very precise to get the result you want,” Farrer said. 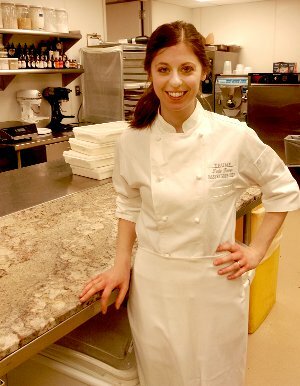 After graduating in 2008, it was on to Chicago where she first attended and then interned at the French Pastry School. Next, she moved to Vanille, a small patisserie owned by an instructor, where she worked for four years, the last two as executive pastry chef. She took an entry-level pastry chef position at Trump in 2013 and has already been promoted to one of two pastry sous chefs. The position offers a variety she enjoys. She might spend her work day baking bricks for a holiday gingerbread house, dipping strawberries for Sunday brunch, or planning the dessert menu for Sixteen, now one of only three restaurants in Chicago to boast two Michelin stars. Farrer’s married to her high school sweetheart, Brian Farrer, who also attended NMC for a year and a half before transferring to DePaul University. He’s a mergers and acquisitions consultant in Chicago. While the couple is comfortably settled in the Windy City now, Farrer remembers NMC fondly. Skarupinski said Farrer’s success should inspire future culinary students, too. “Having her start at NMC is another very good accomplishment for our future students as well,” he said.